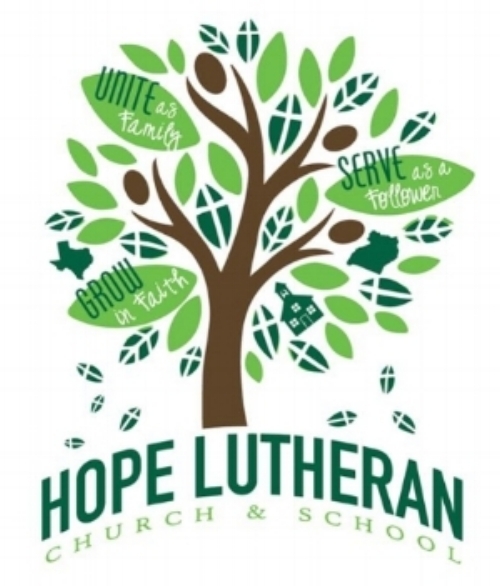 Hope Lutheran Church & School is located in South Lubbock on 98th St. and Frankford Ave.
At Hope, we try to help people do three things... grow in their faith, unite as a family, and serve as a follower of Jesus. Grow in Faith: We know it is important to grow in faith. This is a lifelong goal. There will never come a time in our lives where we say, "thank you God, I have grown enough." We grow through the study of God's Word in the Bible, through learning how to follow Jesus and through serving our neighbor. Unite as a Family: This is true for us as the body of Christ as well as for every family. We want to grow together in our walk with the Lord. God never intended for us to go through life alone. Serve as a Follower of Jesus: In my opinion, this is the goal of the Christian life, to learn how to serve Him as His follower. Serving Him means serving our neighbors. I'm reminded of Jesus' summary of the 10 commandments, "You shall love t he Lord your God with all your heart and with all your soul and with all your mind... You shall love your neighbor as yourself." Matthew 22:37-39. The two, love of God and neighbor, simply always go together. Hope Lutheran School serves early childhood needs from 6 weeks old to Kinder-Prep. We are a faith-based Christian learning center where children are loved and learn through laughter and play. To find out more about our school please check our school page on this website. Hope Lutheran Church is a congregation of the Lutheran Church-Missouri Synod (LCMS). Please visit www.lcms.org for more information. As Christians, we respond to the love of the Triune God: We believe that our Heavenly Father is the Creator of all that exists. This was God’s first act of love for us, that he gave us life. We believe in His Son, Jesus Christ, whose suffering, death and resurrection from the dead saved us from our own sins, from death itself and from the devil. This was God’s ultimate act of mercy and love, that He gave His life for ours. We believe in the Holy Spirit, that He strengthens our faith, encourages us daily as we strive to walk with the Lord and grow in our faith. Our congregation believes that the Bible reveals Jesus to us as our Savior and Lord. We believe the Bible to be “God-breathed” as Paul states in 2 Timothy 3:16. Our teachings and beliefs are all grounded in the Scriptures. 1) Grace Alone – There is nothing a person can do to earn their salvation. Salvation is a free gift that relies completely on the life, death and resurrection of Jesus who has mercy on broken people and broken lives. 2) Faith Alone – The forgiveness of sins, life eternal and salvation all come to us through faith. Faith is a trust in the work of Christ on our behalf. It is often said that faith is the vessel which holds on to grace. It is our faith that motivates us to follow Jesus in our thoughts, our words, our actions. 3) Scripture Alone – As stated above, the Bible is the inerrant, error-less Word of God and is the only rule and guide for our lives and our beliefs. We would love for you to join us for worship! First time visitor? Find out more here! Pastor Hiner is a 2007 graduate of Concordia Seminary in St. Louis. He joined the Hope staff in August of 2014 as the lead pastor. He is married to Heather and is blessed with three beautiful daughters, Kathryn, Lauryn and Madelyn. Dan is a 2006 graduate of Concordia Seminary in St. Louis. He joined the Hope staff in 2017 as the Associate Pastor for Youth and Family Ministry. He is married to Jessica and has three children: Reuel, Kjel, & Damaris. Laura is a lifelong member of Hope. Growing up in Hope, attending the day school, and now working at Hope, she knows everything there is to know about our congregation. She began as our Congregational Ministry Coordinator in 2014. She is the funnel which all items church related flow through. She is married to Cory and is blessed with a daughter, Caly and son, Cason. Heather began teaching at Hope in 2014. She has been teaching in the Lutheran school system for 11 years. She has tremendous experience in the classroom and in early childhood education. She is excited about her role at Hope and looks forward to the years to come! Danielle joined the Hope family August of 2017. She has been certified in business administration and has several years of management experience. She is married to Steven and has two energetic boys, Tobi and Dex. She enjoys long walks through target and coffee. Pastor Pierce was the pastor from the beginning until 1991. Under his pastorship, not only did the congregation receive their charter from the LCMS, but he also moved the congregation to its current location and started Hope Lutheran School, which today still thrives. Rev. Jack Schneider followed Pastor Pierce in 1992, where he and his wife served the congregation faithfully. Carolyn Schneider served as the Director of the School during Pastor Schneider's tenure. Pastor Schneider left in 2001 for Plano, Texas where he served as Pastor for Faith Lutheran Church. Rev. Tim Radkey came to Hope directly out of studies from Concordia Seminary in St. Louis in 2002. Pastor Radkey brought great energy to Hope. During his tenure, the church grew as well as the school under the directorship of Jenni Marsh. In 2006, the current sanctuary was built along with its classrooms. In 2005, Steven Bell began leading worship services which gave Hope a unique sound and worship experience. Pastor Radkey remained pastor at Hope until 2012 when he left for McKinney, Texas where he currently serves as Pastor at Our Savior Lutheran Church. In 2014 Rev. Eric Hiner joined Hope as the lead Pastor. His guidance has led Hope to grow in faith, unite as families, and serve as followers. In 2016 Larissa Jenkins took over as the new school director committed to increasing the quality of care in the classroom. Pastor Hiner continues to lead the church alongside Heather Hiner and Danielle Haney who are committed to seeing the school thrive.